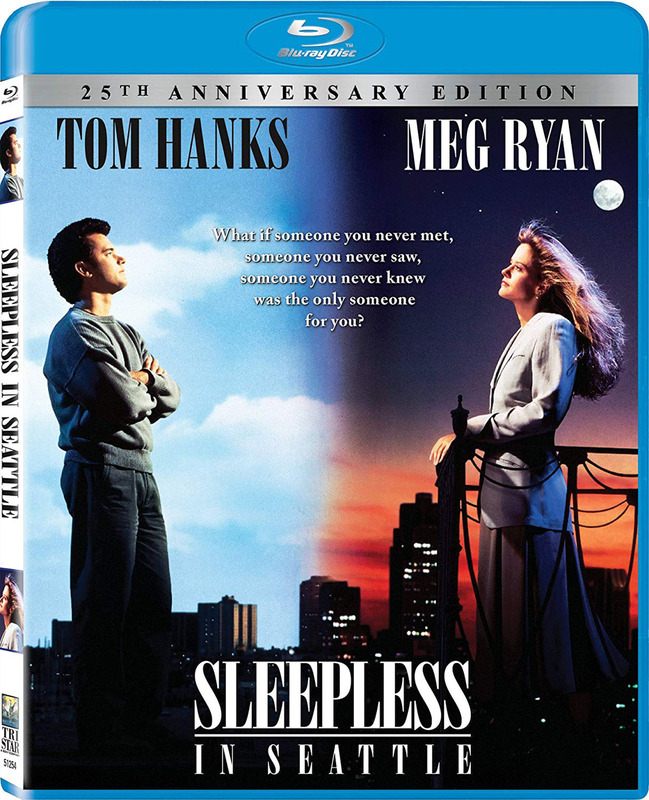 This summer, a beloved romantic comedy that’s remained fresh and charming for 25 years celebrates its silver anniversary so it’s the perfect time to revisit the romance, the humor and the fun of “Sleepless in Seattle” now available on DVD and digital as well as a Blu-ray release that features four never-before-seen deleted scenes and additional archival special features with the cast and filmmakers. Written and directed by Nora Ephron (When Harry Met Sally…,” “Julie & Julia”), the beloved romantic comedy stars Tom Hanks (“Castaway,” “Saving Private Ryan”) and Meg Ryan (“Joe vs. the Volcano,” “You’ve Got Mail”) in the captivating tale of a recently widowed man whose son calls a radio talk-show on Christmas Eve in an attempt to find his father a new wife.He’s an instant hit with thousands of female listeners who deluge his Seattle home with letters of comfort. Meanwhile, inspired in equal parts by Sam’s story and by classic Hollywood romance, writer Annie Reed (Ryan) becomes convinced that it’s her destiny to meet Sam. There are just two problems: Annie’s engaged to someone else and Sam doesn’t know yet that they’re made for each other. A worldwide box office hit when released, “Sleepless in Seattle” earned more than $220 million worldwide and was nominated for two Academy Awards and three Golden Globes. “Sleepless in Seattle” also stars Rosie O’Donnell, Rita Wilson, Rob Reiner and Bill Pullman. Watch as a newly divorced mother resets her life and navigates the world of college when “Life of the Party” arrives on Blu-ray Combo Pack, DVD and Digital Tuesday Aug. 7. The comedy stars Melissa McCarthy. Directed by Ben Falcone (“Tammy,” “The Boss”), the film also stars Gillian Jacobs (“Don’t Think Twice,” TV’s “Love,” TV’s “Community”), Maya Rudolph (“Bridesmaids,” “Sisters”), Julie Bowen (TV’s “Modern Family”), Matt Walsh (TV’s “Veep,” “Ghostbusters”), Molly Gordon (“Love the Coopers,” TV’s “Animal Kingdom”), Stephen Root (“Mike and Dave Need Wedding Dates”), Oscar nominee Jacki Weaver (“Silver Linings Playbook,” “Animal Kingdom”), Jessie Ennis (TV’s “Better Call Saul”), Adria Arjona (TV’s “True Detective,” TV’s “Emerald City”), Debby Ryan (TV’s “Jessie”) and Jimmy O. Yang (TV’s “Silicon Valley”). Falcone’s behind-the-scenes creative team includes director of photography Julio Macat (“The Boss,” “Horrible Bosses 2,” “Daddy’s Home”), production designer Rusty Smith (“The Boss”), editor Brian Olds (“Central Intelligence”), and costume designer Louise Mingenbach (the “The Hangover” franchise) with music by Fil Eisler (“How to Be Single,” TV’s “Empire”). A New Line Cinema production, “Life of the Party” is distributed worldwide by Warner Bros. Pictures, a Warner Bros. Entertainment Company. McCarthy and Falcone, who are married, co-wrote the screenplay and produced through their production company, On the Day Production. Chris Henchy is also producing the film, with David Siegel serving as executive producer. “Life of the Party” will be available on Blu-ray Combo Pack for $35.99 and DVD for $28.98. The Blu-ray Combo Pack features a Blu-ray disc with the film and special features in high definition, a DVD with the film in standard definition and a Digital version of the movie. It also will be available on Movies Anywhere. Using the free Movies Anywhere app and website, consumers can access all their eligible movies by connecting their Movies Anywhere account with their participating digital retailer accounts. The comedy is also now available from various digital retailers. “Digimon Adventure Tri.—Coexistence” arrives for the first time in North American Tuesday Aug. 7 in a collectible Blu-ray and DVD Combo Pack from Shout! Factor and Toei Animation. The animated adventure boats the exciting movie presentation in two versions (one with an English-speaking voice cast and the original Japanese audio with English titles). The arrival of rampaging Meicoomon starts the countdown to the real world’s collapse. A series of abnormal phenomena occur everywhere. The Digimon who appear through the distortions were waiting for this time to come. The DigiDestined are cast out of the digital world when it goes out of order, and even after returning to the real world, they’re driven away by people on account of their accompanying partner Digimon. Meanwhile, a cruel fate is imminent for Kari, possessed of an honest and sensitive spirt. An all-new interview with voice actor Johnny Yong Bosch is the bonus feature. An official selection at 2017’s Toronto International Film Festival, the horror flick “Marrowbone” arrives on 4K Blu-ray, Blu-Ray Combo Pack, DVD and Digital 4K Tuesday Aug. 7 from Magnolia Home Entertainment under the Magnet Label Starring Anya Taylor-Joy and Charlie Heaton, “Marrowbone” is a terrifying thriller that tells the story of a family haunted by the troubled past they are trying to escape. Special features include deleted and extended scenes, behind-the-scenes footage and a visual effects reel. Locked out of the house by a group of ruthless intruders, one mother must summon every bit of her strength and smarts to save her children who are trapped inside in the edge-of-your-seat action thriller, “Breaking In,” arriving as an unrated director’s cut on Blu-ray, DVD and On Demand on Tuesday Aug. 7, from Universal Pictures Home Entertainment. It also is available on Digital and the digital movie app Movies Anywhere. Producers Will Packer (“No Good Deed,” “Obsessed”) and Gabrielle Union (“Almost Christmas,” “Being Mary Jane”) reunite for this original action thriller that follows a mother who encounters every parent’s worst nightmare. Bring home the film’s Unrated Director’s Cut on Blu-ray, DVD and Digital and discover gripping never-before-seen content, including an alternate opening, deleted scenes and exclusive featurettes. Shaun Russell (Union) takes her son and daughter on a weekend getaway to her late father’s secluded, high-tech vacation home in the countryside where the family soon receives an unwelcome surprise from four men who break into the house in search of a hidden safe. After managing to escape, Shaun stops at nothing to turn the tables on the thieves and rescue her two children being held hostage in a house designed with impenetrable security. No trap, no trick and especially no man inside can match a mother with a mission in “Breaking In.” Directed by James McTeigue (“V for Vendetta,” “Sense8”), the film also stars Billy Burke (“Twilight” Series), Aijona Alexus (“13 Reasons Why,” “Acrimony”) and Seth Carr (“Black Panther”). Laugh to keep yourself from dying with “Dead Shack,” arriving on Blu-ray + DVD Combo Pack, Blu-ray, and DVD Tuesday Aug. 7. “The comedy horror flick features a fresh-faced cast as they try and get through a family vacation alive. It’s shaping up to be a good weekend for Jason, a shy teenager. He’s driving up to a cabin in the woods with his brash best friend Colin, Colin’s older sister, Summer, and their father and step-mother, Roger and Lisa, who are permanently stuck in party mode. But things quickly go south when Jason, Colin and Summer witness their neighbor feeding two locals to her undead husband and kids. Realizing their own potential fate, the kids must work together to bash zombie skulls and save themselves from the neighbor’s ghoulish family. From Director Peter Ricq (“Come Together”), “Dead Shack” stars Matthew Nelson-Mahood (“Heaven”), Lizzie Boys (“Winter’s Dream”) and Gabriel LaBelle (“Max 2: White House Hero”). Extras include a behind-the-scenes featurette and the trailer. “Dead Shack” is available for a suggested retail price of $32.98 for the Blu-ray + DVD Combo Pack, $29.98 for the Blu-ray and $26.98 for the DVD. The indie horror film “The Nursery” will be released on DVD in North America on Aug. 7, by Uncork’d Entertainment. The DVD will feature exclusive content and extras, including insightful audio commentary by the filmmakers, a “making of” featurette and more. “The Nursery” already is widely available for sale or rent on a range of video-on-demand platforms, including Amazon Instant Video, iTunes, Google Play, the Dish Network, Vudu and cable’s iNDEMAND network. It will be available on DVD on Family Video, Amazon.com and more. Acorn TV features the DVD debut of the outrageous police procedural “No Offence, Series 1” Tuesday Aug. 7. The outrageous female-driven police procedural follows an unorthodox team of cops in Manchester. From legendary writer Paul Abbott (“Shameless,” “State of Play”) comes this police comedy-drama with fierce female characters and a shrewd, irreverent take on crime. The critically-acclaimed dramedy stars Joanna Scanlan (“Requiem,” “The Thick of It”) and Elaine Cassidy (“Acceptable Risk,” “The Paradise”). The three-disc DVD set features eight episodes, plus bonus featurettes ($49.99, Amazon.com). “No Offence, Series 1” made its U.S. premiere in April 2018 on Acorn TV. Charismatic DI Vivienne Deering (Scanlan) leads an ace but unorthodox squad that tackles Manchester’s most gruesome and off-the-wall crimes, including drug dealers, neo-Nazis, and black-market organ sellers. When strong-willed DC Dinah Kowalska (Cassidy) connects a body at the morgue to a group of murdered girls with Down’s syndrome, Viv and her team begin the hunt for a serial killer. What they uncover could leave even the most seasoned officers reeling. Loaded with dark humor and shocking plot twists, this award-winning series also stars Alexandra Roach (“Iron Lady,” “Anna Karenina”), Will Mellor(“Broadchurch”), Paul Ritter (“Vera”) and Colin Salmon (“Arrow”). Whether you’re in the mood to watch a pulse-pounding action thriller or a timeless romance, Front Row Features has got you covered with this week’s giveaways. Not only are we giving away a copy of “Breaking In” on Blu-ray/DVD Combo Pack featuring both the theatrical version of the movie as well as an unrated director’s cut, but we’re also giving away three copies of the recently released 25th anniversary edition of the classic Tom Hanks/Meg Ryan romance “Sleepless in Seattle” on Blu-ray boasting four never-before-seen deleted scenes and additional archival special features with the cast and filmmakers. For your chance to win, simply email SoCalMovieEditor@aol.com by Monday Aug. 13 with the title of which movie you want to win in the subject line. Good luck! Next PostPhotos: ‘Sleepless in Seattle,’ ‘Marrowbone,’ ‘No Offence,’ More on Home Entertainment … Plus Giveaways!! !